Battle others using your favorite characters from the Mega Man X universe! Dev note: with the new year comes new changes. The name of the game (formerly Mega Man Galaxy X) has been changed: it's now called Mega Man X Versus (MMXVS for short). We've also moved to beta and are planning the next version for release on Feb. 15th 2019. Scores and unlockables will be introduced so that your performance is stored on the hub and extras can be accessed. Most exciting: new characters are coming! Light X and Iris, and in the near future, Vile!!! Tl;dr these last few weeks of waiting will pay off dearly for fans of the game. This was the initial beta release, which wasn't announced on these forums at the time of its release (late last year). This announcement is a bit delayed due to our Holiday break. 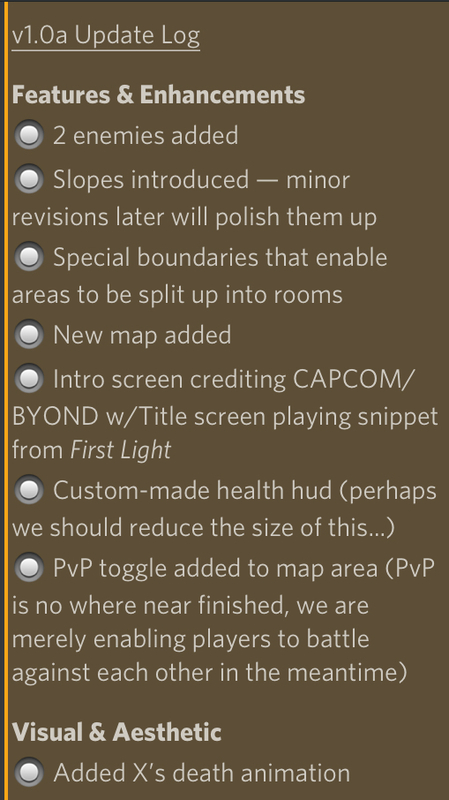 For this build specifically, the goal was to polish several aspects of the game and introduce a redesigned OASIS map to play on. · On-screen Radar has been implemented (hidden in current version) to aid with stage navigation. Opponents are shown as blips on the radar, colorized to match the character they're playing as (blue for X, red for Zero, etc.). · Jump physics tweaked to feel fluid and instananeous. It's effortless to climb walls in this version compared to earlier builds. You'll probably notice it immediately. · Zero's Saber has been tweaked to expand his hitbox distance (ensures successful blows while in range of an opponent). · OASIS has been redesigned to be smaller and easier to traverse. It's a lot more condensed and not super sprawling. Slimmed down total area size, moved features around, and added in additional platforms for climbing; end goal plans with this stage include adding in laser obstacles and teleportation areas (warping you from point A to point B to aid with navigation). · The character select screen has been redone and now includes details about the character you're currently hovering your mouse over. Previews of character behavior also shown beside the description box. · A kill log has been implemented that shows everyone in the world who died and who killed them, and to guide players through combat. · Info window now available that details new features in updates, as well as listing staff/contributors and a button for a play guide that's planned for the future. · Mute button added to Music prompt (in Options cog). 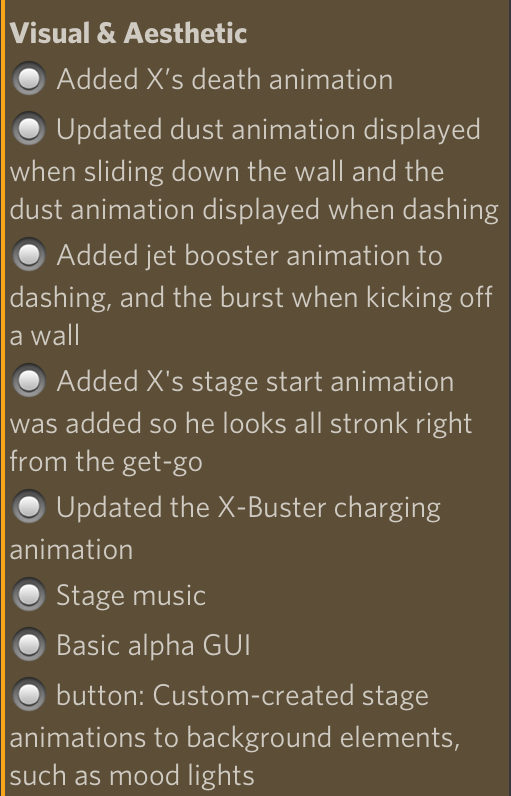 · Control customization prompt enhanced to be easier to use and understand. Visual guides such as dynamic label colors and text help you know which controls have been adjusted. Live 24/7 on the hub! Final Alpha build. MGX will be graduating to Beta mode in November 2018. This build is mainly an enhancement update that provides increased performance, expands customization, and improves overall UX. Now live on the hub! feels very slow, you should make the move speed for every character faster also if you dash and jump into a wall, the character stays in his dash animation whilst sliding on the wall. Thank you for the feedback, Kevin208. Corners are still being smoothed out with the framework in general and enhancements continue to be made -- recently with improving the responsiveness of wall-kicking and the accuracy of Zero's "saber slash" -- however the issue you're raising hasn't been mentioned by any of our players yet. Could you elaborate on what "very slow" means in regard to movement? Is it lag you're feeling, or general slow pixel movement (something that can be adjusted easily if necessary)? Until we can understand and replicate these bugs, we cannot slay them. Thanks for your input Kevin!